This coffee will be fresh roasted for you. 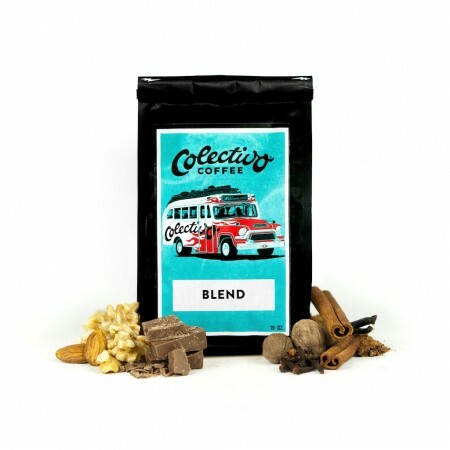 We expect Colectivo Coffee will roast and ship this coffee in 1-2 business days depending on their roasting schedule. The Co-Optiva Fair Trade & Organic Blend was blended and roasted for you by Colectivo Coffee. Co-optiva is a celebration of the small-scale farmers who are committed to growing high quality coffees. Combined of Organic coffees produced by Fair Trade-certified cooperatives to highlight the coffees sourced through some of Colectivo's long-standing relationships. With flavors reminiscent of chocolate and molasses, this cup is full-bodied with medium acidity, suitable for sipping all day, every day. This was pretty good! Tasty, though I felt like I had to add more beans than normal to get to the full bodied taste. This bag went pretty quickly. Molasses is accurate. Almost a bit dark fruit esque, maybe some blueberry? This one is good - not too acidic. Definitely a step up from the last few! I still prefer mine to be more nutty and chocolatey than fruity/molasses. Very intersting though. I like this coffee's strong flavor. Maybe a little to acidic in the aftertaste (minor complaint) but very close to my perfect coffee. Does have some chocolate and hint of molasses, this has more flavor that the Schweitzer Mountain just prior to this? Seems full bodied, but fairly smooth and balanced, and I prefer this more than the Scheweitzer Mountain. Nice flavors, but not a 5. First impression is the coffee smelled and tastes a lot better than what I was drinking. I liked the roast level - medium style coffee. Really smooth finish, with a nice overall sweetness. I typically don't drink coffee black, but this one is perfectly good sipping without cream and sugar. Solid coffee with hints of chocolate. I can't taste the molasses but the full-body really helps. This was one of the best ever. Very smooth flavors of chocolate. Loved it and would order again.